In Toronto, Canada, where I live, we’re getting close to March break where kids and teachers get the week off school. It’s a one week break and then everyone comes back for another ten or twelve weeks until summer holidays when school closes for most of June, and all of July and August. During March Break school closes down and the daycares get busy. I often have a few extra bookings to come in for a special Kids Yoga program at daycares during this school holiday. If you’re a kids yoga teacher looking for new classes, it’s a good time to go out to daycares close to you and offer them a one class special. When you teach a one-time yoga class it is a chance to introduce the yoga experience to the daycare. Give them a yoga class they won’t forget. Some kids will remember the class for months. I’ve returned to daycares for the summer program and the kids will ask to play the game or do the activity that we did during March break. If they have fun they will remember it. When I do a one-off class, I teach my favorite (at the time) kids yoga activities. Something that I know all ages will like and games that they will remember. It’s not a time I try out something new or something untested. Here’s one of my older posts with Five of my Favorite Kids Yoga Activities that always work for me. 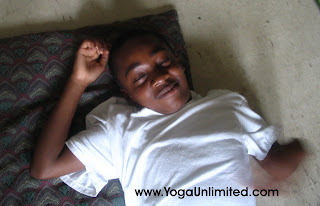 One of the kids favorite parts of yoga is the relaxation time. I’ve heard again and again from other teachers that kids are so busy they really appreciate a time to relax in the class, not just yoga class but in the classroom as well. I make sure we have at least five minutes for relaxation. In a March Break class I like to play soft music and come and see who is relaxed. If you ask the kids what a corpse is you will get some interesting answers. Then ask the kids to let go of their body for the relaxation so that it is like a corpse, so it doesn’t move, they don’t move it, they let their body lie there, still and lifeless. Then come around to each child and test the body to see if it is lifeless/corpse-like. Pick up the child’s arm and move it around. See if it is floppy or stiff. Ask them not to lift their arm to you but wait till you lift their arm. If you have time, you can test arms and legs. With a large group ask other teachers to help you. This relaxation game is very popular. It’s also a nice moment to connect with each child as you test them. If you still have time left, you can reinforce the yoga you taught already with Yoga Freeze Dance . Most kids like it because it is creative (dancing) and you can play it so that no one gets out. If you really want everyone to have fun, choose a game where no one gets out. I’ve found most kids prefer these types of games. So if you live somewhere where March Break is coming up, it’s a great opportunity to introduce yoga to a daycare. Even daycares with a limited budget, usually have something put aside for their March Break program. With some favorite yoga poses, an intriguing game, and a fun attitude you just may develop a relationship with a daycare that can continue on into the summer and beyond.